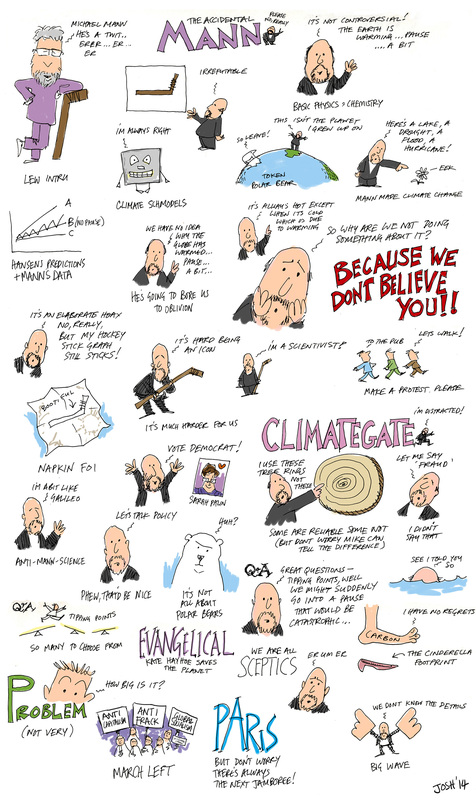 The Josh 'climate selfie' – and livetooning the Michael Mann lecture at Bristol | Watts Up With That? Yesterday Josh finished all of his cartooning related to my trip to the UK, the meetings with skeptical friends, and the Mann lecture. I present them all here because he’s been waiting for me to recover from my trip enough to resume regularly scheduled programming. Now that I have mostly recovered (though still a bit stiff from air travel confinement), I can post them all here in one nice tidy package. Enjoy. And, since I can never say this enough, thanks to all of my friends in the UK for their hospitality, their support, and traveling often hundreds of miles just to say hello. The trip, made possible by WUWT readers, was both successful, and humbling. 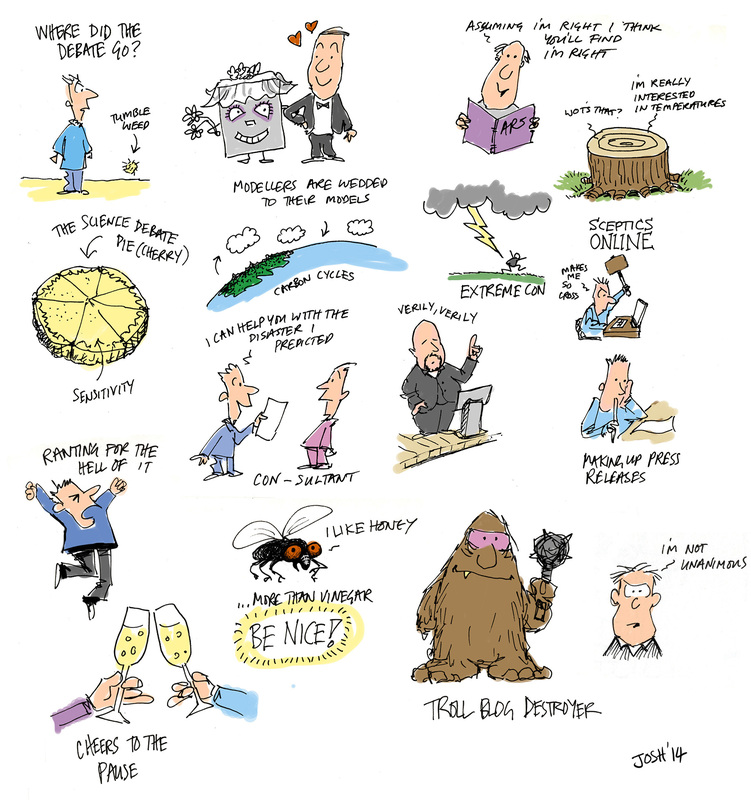 The first cartoon is from our meeting prior to the lecture at Caroline K’s house. The second is from the lecture itself. We all signed and sent a nice postcard to Dr. Judith Curry after the meeting, which was promoted by some of the elements above. In the panel below, Prof. Lewandowsky was leaning up against the lectern exactly like that as he rambled off a long list of accolades for Dr. Mann during his introduction. September 25, 2014 in Humor, Satire. But my spiky gene pool would probably have been discordant. Still, now I feel like I was there. Thanks, Josh. 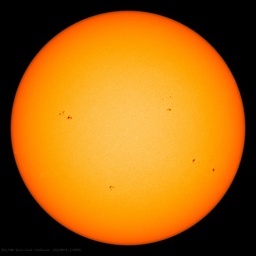 But the “Mann-made Gobal Warming” is real! Great ‘selfie’! I just want to know, is it Nic Lewis or Delingpole(?) goose-ing MM – or has he sat on his hockey-stick? Love them all. Michael Mann looks like he has just read the CEI brief, and his sphincter went into spasms. OMG! (It’s appropriate) – I’ve just spotted that MM is wearing a clerical collar! He may as well take that final step and become a paid “expert” and spend his sunset years in court cases … he’s practically there already. Q: How can Mike know which tree rings to use? Accommodations can always be made with other people. It’s a simple matter of choice, or not. Here is how it’s done from Columbia Business School when Glenn Hubbard was passed over for Ben Bernake. Did they pose like that or was it drawn from memory? Ha ha! 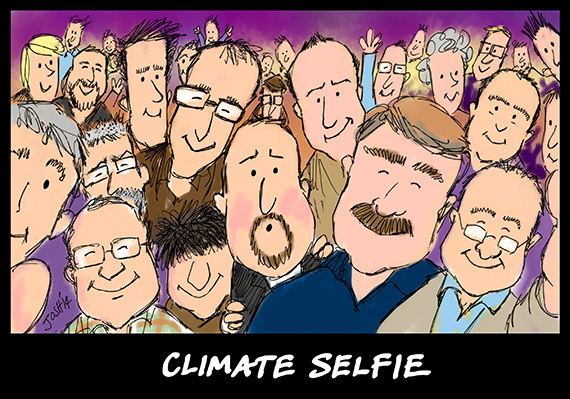 Love the Climate Selfie! 🙂 Maybe that will be included in the 2015 WUWT wall calendar…? I think we all need climate sensitivity training. It’s the “climate science” apologists who need sensitivity training. “Michael Mann, get thee behind me!” Great job, Anthony and Josh! Which THREE rings is M. Mann referring to I wonder? Love the toons Josh, looking forward to the 2015 calendar. You came, you saw, you conquered. That must have rankled with his holy Mannness.